One of our FOSS kits is Earth Materials. We use it with our 3rd graders for ENCORE science. That means that I am a "specialist" who teaches our kiddos science for one hour per week. The teachers this year are to teach science in their classrooms using our theme or unit. Our district six years ago went to this model to give our teachers more prep time, and to get science to our students. In some rooms it meant more science and in others...less. This year, we have a new schedule that allows for our classroom teachers to enhance science in their rooms so I made this for my teachers to help me make. We are learning about the rock cycle in our 3rd grade science classrooms. 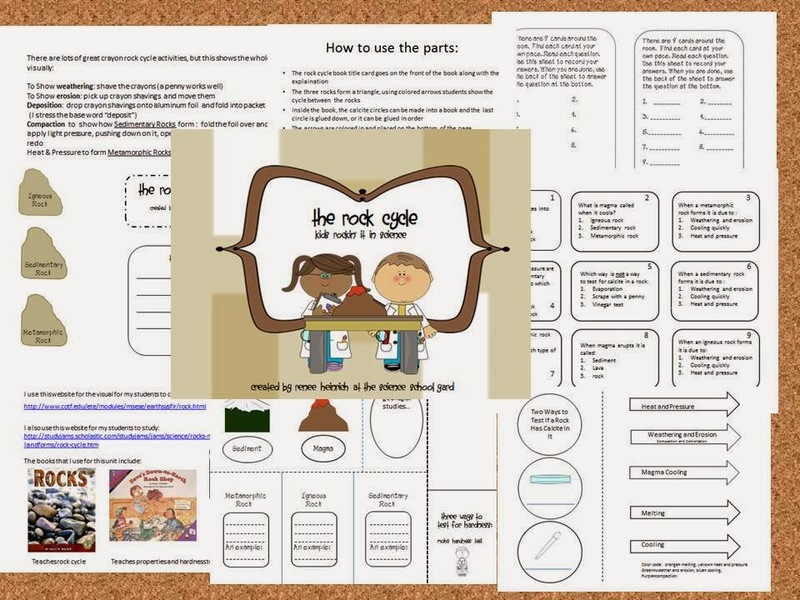 I made a little activity that helps our kiddos review the three types of rocks using a graphic I put up on the projector. We are in the middle of creating this book for review. I will post pictures next week when they get closer to completion. Check it out at TPT. Our kiddos loved this song, they know the tune and can sing along!